Ocean View Ground Floor 8H -Close To Pool - Great Sunsets. The condo is decorated in quality island style furniture. The master bedroom has a king size bed, 42' plasma TV, walk in closet, and separate tub and showers. The first guest room has a queen size bed, and a 32' LCD TV with DVD palyer. The second guest bedroom offers two twin beds, and a 32' LCD TV with DVD player. There is seating for 8 at the table. There is a queen size sofa-bed in the living room. The lanai has seating for 4 with a large Weber propane BBQ. Great ocean views from the master bedroom, living room, dining area and kitchen. The ground floor also offers the great grass area behind the unit. We have a tailgate toss bean bag game available for our guests. The living room has a 3 cushion sofa with hide-a-bed, and two large wicker chairs, a 55" LCD TV, a blu-ray player and a bluetooth speaker. The dining room has a glass dining table with seating for eight. We have three young children ourselves so the unit comes with a highchair, port-a-crib, and toys (please be sure the kids leave them behind). The oceanside pool area offers a great workout area, plenty of seating, a private restaurant/bar and a BBQ pit. For those of you who prefer the beach we have provided beach towels, beach chairs, boogie boards and a couple umbrellas. Your stay here will be a memorable one. We hope you will return year after year. There is a $20/day resort fee per condo which is paid directly to the resort at check in. As per Hawaii House Bill 2078 Act 326 we have designated Bruce Eskaran as our “Hawaii - Big Island” on island contact for our guests to contact in case the owners are not reachable. Please attempt to contact Doug Erickson “Owner” before calling Tracy if assistance is needed. We are a young family who likes to travel. We have 3 young daughters and 2 female dogs (daddy is out numbered). We live in Northern California. Our goal is to provide our guests with the same vacation experience that we expect and enjoy. We have enjoyed visiting the 'Big Island' since our honeymoon is 2000. We used to stayed at a very famous resort until a few years ago when they tried to charge us $50/night per fold up bed when we were on a (Family Package). After that we decide we wanted to continue to visit Hawaii, but did not want to deal with the hotel 'profit centers' any more. 1 car garage available for guest use. Great ocean front pool area - Private for Hali'i Kai guests only. This gated community has a great oceanfront pool, spa, exercise room and private restaurant poolside. The unit is kid friendly with, highchair, port-a-crib, and kids kitchen items, yard games, board games, DVD in each room, tennis stuff and more. What a gorgeous spot! With heavenly gardens and views of the oceans right outside your lanai, a quick jaunt to a breathtaking pool, and a short drive to the world’s best beaches, we couldn’t have picked a better home base on the Big Island. The condo is well supplied with all things fun that you need to play on land or sea during your stay. I can’t wait to return! We enjoyed every moment of our stay at this unit. Incredible ocean views from the lanai - watched the whales every day. The condo is equipped with absolutely everything we could have hoped for, and is very family friendly. It is very well kept, and we enjoyed the relaxing atmosphere it provided. Just a short walk to the beautiful pool and Ocean Club where we were treated to great service and hospitality. It’s proximity to the golf course and shoreline added to our experience. We found Doug very accommodating, and we are already looking forward to next year! Wonderful experience. 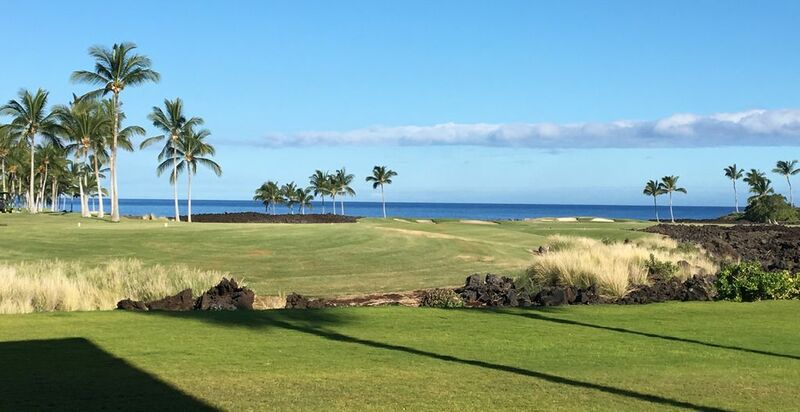 Between the view of the golf course, the magnificent waves crashing on the lava and the whales cruising by on a daily basis, it doesn’t get any better! We loved the condo- well stocked with everything you could possibly want. The kitchen especially had everything. It was hard to leave after such a great experience. The pool area with a bar and restaurant really added to our experience. Can’t wait to return! Fantastic Vacation! We didn't want to leave. We all had a great time. The condo was perfect for our family! The unit was stocked with everything. Doug, the owner was extremely responsive and was a great host! The grounds, pool, work out facility...we loved it all! The pool staff is a little tough on children, but a beautiful setting! This is a vacation we will never forget. Very well stocked and roomy property with wonderful outdoor space for the kids to play. Loved the pool and the amenities there. Will be back!